Some people feel that government health department messages to encourage vaccination can be too heavy-handed or negative for some people’s tastes. In a recent post I discussed rubella infection and it’s impact in early pregnancy. The illustrations for that article feature a New York State program to encourage children to be vaccinated against rubella. 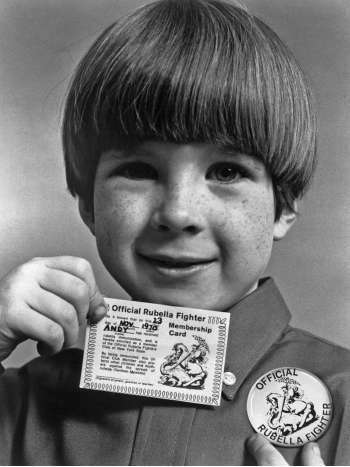 While old-fashioned what struck me was the positive approach used, the ’rubella fighter’ cards and label buttons, and that the message was targeted at encouraging the children as much as (if not more than) the parents. I’d like to throw readers a loose thought, or rather a or three. Would a similar strategy–adapted to modern tastes of course–be useful today? Would these complement the existing approaches? Would it even work? Perhaps today’s kids wouldn’t buy into it the same way? I suspect that today’s audience is too sophisticated for that kind of rah-rah approach – it’s like ads from the 1950s seem gauche and overdone to today’s consumers. The problem is that anything, whether positive or negative, seems automatically suspicious to the target audience (people ambivalent about vaccination) when it comes down from on high – see Mark Sainsbury’s quizzing Dr Stuart Jessamine on Close Up over where the funding for the Gardasil campaign came from, after the death of a young woman whose mother blames it on the vaccine. And Gardasil’s a pretty gentle and positive campaign. You may have something here. I am a science teacher. Last year during a human biology topic with a year 9 class (13/14 yr olds) we got onto the subject of vaccinations. I told them about the effects of rubella in pregnant women and mumps on adult males (I will confess to playing it up a bit though) At the end of the class when the students did their reflections (about their learning), a number of them talked about going home to check with their parents if they had received their vaccinations. This was a low decile school so there is a good chance that some of them won’t have been vaccinated. At this age kids are getting very aware of their ‘reproductive potential’ so anything that could impact on that, will catch their attention. Remember this is targeted at kids, not the parents (at least not directly). Also, although I didn’t elaborate, I was thinking along the lines of something issued at a “grass roots” level, i.e. by the GPs, not something that came “from on high”, e.g. on TV, directly from the MOH or what-have-you (which is more for an adult audience in any event). I like your second paragraph. Anecdotal approaches can reach more people, but they have to be a bit careful too of not over-selling or over-generalising. Michelle, are you replying to ‘Trouble’ or me?! It’s the parents’ decision, though, and not the kids’. Pester-power might work with those who haven’t got around to vaccinating their kids, but not for those who think they’re making an informed decision not to vaccinate. They’d just get defensive that their kids are being directly targeted. Popular magazines pitched at mothers (who are the ones who by and large make the appointments and take the kids down to the doctor) would be a good way to get to that audience – think how effectively Jenny McCarthy used Oprah. There’s already piles of stuff that doctors, nurses and Plunket etc provide directly to their patients. No need to apologise, just making sure I was reading it the way it was meant to be read. It’s good to have your comment. It’s something I didn’t think of and should have too, but there is a school/teaching side to it.